In 2008 Inland Building Systems, a charter member of the Metal Building Manufactures Association became a part of the Schulte Building Systems family. Since that time, Inland has had plenty of reasons to be proud of, including the substantial investment by our parent company in completely renovating our plant and we now have a state of the art manufacturing facility. We’ve increased our capacities and improved service levels with tighter tolerances and shorter delivery times. These improvements have allowed IBS to continue to provide a high-quality product at a competitive price. It is not just modern equipment, we’ve added skilled, trained and certified people in our Drafting, Engineering and Sales teams to design more complex metal buildings, provide exceptional customer service and be responsive to our customers’ needs. Our work environment at IBS is one of business, growth and having a bit of fun along the way. This philosophy contributes to our success through the collective efforts of our employees, customers and vendors. 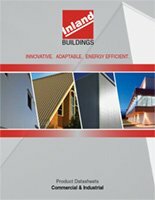 Going to market with outstanding employees, loyal customers, and supporting vendors makes Inland Building Systems the Metal Building Manufacturer of choice. I would welcome the opportunity to demonstrate how we can help you and your team along the road to success in the marketplace.